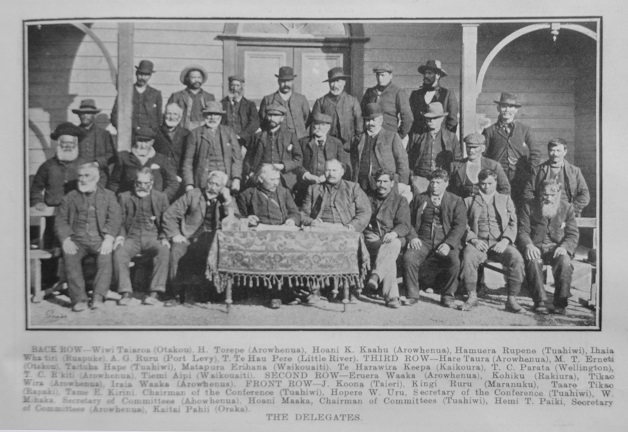 A meeting of Ngāi Tahu and Ngāti Māmoe representatives at Te Hapa o Niu Tireni, Arowhenua in 1907 to discuss the recent South Island Landless Natives Act (Photograph courtesy of the Christchurch City Council, IMG0010). Back row: Wiwi Taiaroa (Ōtākou), Hamuera Torepe (Arowhenua), Hoani Korehe Kaahu (Arowhenua), Hamuera Te Au Mutu Rupene (Tuahiwi), Ihaia Taoka Whaitiri (Ruapuke), Apera Pirini Ruru (Port Levy), Hoani Te Hau Pere (Little River). Third row: Hare Taura (Arowhenua), Matiu Te Hu Erueti (Ōtākou), Taituha Hape (Tuahiwi), Matapura Erihana (Waikouaiti), Te Harawira Keepa (Kaikōura), Taare Rakatauhake Parata (Wellington), Tiemi Rickus (Arowhenua), Tiemi Hipi (Waikouaiti). Second row: Eruera Waaka (Arowhenua), Kohiku Titi (Walter Joss) (Rakiura), Tikao Wira (Arowhenua), Iraia Waaka (Arowhenua). Front row: Jack Connor (Taieri), Kingi Kurupohatu (Maranuku), Teone Taare Tikao (Rāpaki), Tame Green (Conference Chairman, Tuahiwi), John Hopere Wharewiti Uru (Conference Secretary, Tuahiwi), Wiremu Mihaka (Committees Secretary, Arowhenua), Hoani Maaka (Committees Chairman, Tuahiwi), Tamaio Hemi Paiki (Committees Secretary, Arowhenua), Kaitai Pahii (Oraka). On 16 July 1907 Te Hapa o Niu Tireni hosted a major hui of Ngāi Tahu and Ngāti Māmoe representatives from around Te Waipounamu that was pivotal in regenerating tribal efforts to advance the Ngāi Tahu Claim. In 1906 the South Island Landless Natives Act allocated 116,000 acres of ‘Crown waste land’, including some of the most desolate bush country of western Southland and Rakiura (Stewart Island) to 4,000 landless Ngāi Tahu people. This amounted to an average of 31 acres for each of the listed Ngāi Tahu iwi members. This was a stark contrast to landless Europeans of the same era, who were being awarded parcels of productive farmland approximately five times that size. The inadequacy of its awards resulted in much dissatisfaction amongst the iwi. Due to the dissatisfaction, the following year a large gathering of tribal representatives met at Te Hapa o Niu Tireni to discuss the recent SILNA legislation. ‘The Ngaitahu and Ngatimamoe Executive Committee’ was established with Tiemi Hipi (Jimmy Apes) from Puketeraki appointed its president. The committee’s role was to collate documents, appoint legal advice, call meetings and levy rūnanga for the fighting fund. In 1909 Tiemi Hipi and 916 others signed a petition seeking an investigation into Kemp’s Deed with the Executive Committee presenting its petition to the Native Affairs Committee in 1910. Despite the 1914 Gilfedder-Haszard Commission of Inquiry investigating the provisions made for landless ‘Natives’ in the South Island, no outcome was to avail. Following World War I, the 1921 Native Land Claims Commission investigated various Māori petitions, including the 1909 Ngai Tahu petition. The Commission ruled in favour of Ngāi Tahu recommending £354,000 monetary compensation to the iwi. Then in 1944, recognising an obligation to its Māori constituents for Māori sacrifices in World War II, the Ngaitahu Claim Settlement Act provided Ngāi Tahu with some relief authorising £10,000 annual payments for 30 years. This figure was based on the recommendation from the 1921 Native Land Claims Commission that investigated the 1909 Ngāi Tahu petition. Although compensation was paid, there was a long campaign to introduce a Consumer Price Index-based inflation adjustment to the annual £10,000 payments because in real terms the compensation received was declining year on year. This resulted in the Trust Board petitioning the Māori Affairs Committee in 1969 and 1972 to revoke the 1944 Ngāi Tahu Settlement and receive perpetual annual payments of $20,000 instead. What is important to note though, is that the hui at Te Hapa o Niu Tireni, laid the foundation for the final push for the Ngāi Tahu claim.